On September 17, 2004, Kathi and I arrived at the Klamath Falls KOA in Klamath Falls, Oregon where we planned to spend a week. Our oldest son AJ was on his own walking the streets of San Francisco and enjoying the great weather there. Our youngest son, Christopher was in the Marine Corps stationed at Twentynine Palms, California. Christopher and fellow Marine, Andrew Harris were going to share a ride to the Marine Corps Ball in Las Vegas in November and Kathi made reservations for them. AJ was exhilarated with the fresh air and freedom he was enjoying, Christopher and Andrew were jubilant with anticipation about the ball and Kathi was loving being in the mountains with me and sharing the excitement with the boys. Me, I always feel good and I was happy the rest of the family felt good too, especially in my circumstance of being an RV traveler and visiting new locations while driving through the mountains. After a week exploring Klamath Falls, Kathi and I were both ready to move along to our next stop in Reno, Nevada. We had been to Reno once before when Shell Chemical Company sent me to the Ralston Purina manufacturing and packaging facility in Sparks, Nevada to see their team building procedures. We stayed at the Silver Legacy Hotel and Casino and while I went with the Shell delegation to Sparks, Kathi explored the casino to find the most fun possible. It was a fun trip for all involved. Now seven years later we were returning to Reno in retirement and driving a forty foot RV. 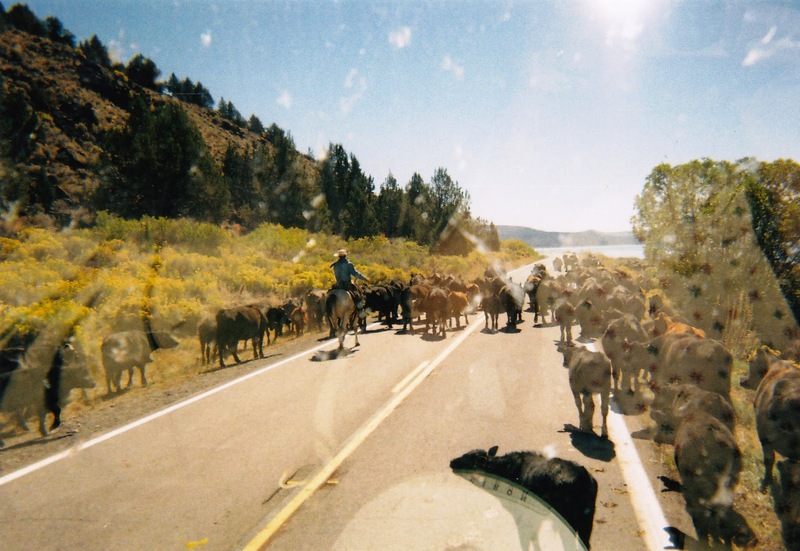 We had a great drive to Reno and going around a mountain road, we came upon a cattle drive. There were about one hundred steers and six cowboys herding cows around us. The weather was great, the sunshine was bright and the air was warmer than Oregon, but still cool and the cow herders made it even cooler for us. I turned off our diesel engine and we just sat watching, until a cowboy rode over and asked us to move forward slowly and assured us the cows would steer themselves around us. It left us with a memory that stills seems fresh in our minds. See the Shadow of our Alfa behind the cattle drive. After the great drive we enjoyed getting to the Silver Sage RV Park in Reno. The RV Park was across the street from the Peppermill Spa Resort Casino. A casino within walking distance was tempting, but we planned on resisting the temptation for a few days. The RV next door was a Prevost that looked like it was made of stainless steel. I am sure it was not because of the weight, but it was nice. It looked great and the owner was still outside wiping it down with a dust mop. I was trying to stop a water leak on our Alfa and when I got the issue resolved I walked over to talk to our neighbor and he admitted his rig was already clean, but he needed something to do while his wife was at the casino. He claimed she went over every day and came home with more money than she left with, so she was in no hurry to move. I was hesitant to tell Kathi this news, because she loves the casino atmosphere and I was afraid I would have to spend the rest of my life dust mopping our RV. In the sense of full disclosure, I told her and I could tell it was a struggle to resist the urge to walk right over to the Peppermill to pick up some of their easy money, but we settled for a short drive around town. Next post – “Around Reno”.